Australians are fascinated with their nation’s experience of World War I, and particularly with the people who fought and died in that conflict. Our annual observance of Anzac Day, the sustained consumption of books and films about Australia’s military history and, not least, the popularity of family history research all mean that war assumes a prominent place in Australia’s awareness of history. Who were the first Australians to land at Gallipoli that tragic day almost a century ago? What do their stories reveal? Professor Peter Stanley investigates. With the approach of the war’s forthcoming centenary, we can expect that interest to increase. But what do we know of the detail of our military history? Here’s a test: name one man who was killed on 25 April 1915. Don’t worry if you can’t. Most people, even those who read military history or who do family history research, can’t actually name one of the 750 or so Australians who died in the landing at Gallipoli, unless they know their history very well, or if they have an Anzac in the family. This is ironic. Every year on 25 April, the nation remembers those who have died, and continue to die, in war. Of all Australia’s war dead, the individuals who died at Gallipoli, might be most easily called to mind. And so they are: but in the abstract, as a group. Individually they remain sadly obscure. A couple of years ago, the publisher of my book, Digger Smith and Australia’s Great War, asked what I had in mind for my next book. I realised that for all of the dozens of works devoted to Gallipoli, we actually have tended to take the dead of 25 April 1915 for granted. I began to see the possibilities of a book very different to Digger Smith. That looked at the Australian experience of World War I through the lives and deaths of people called Smith (and Schmidt) — taking in soldiers and sailors, but also voluntary workers, interned German-Australians, wives, mothers, fathers, children, and widows. The next book, I thought, could by contrast look at a small group on just one day. 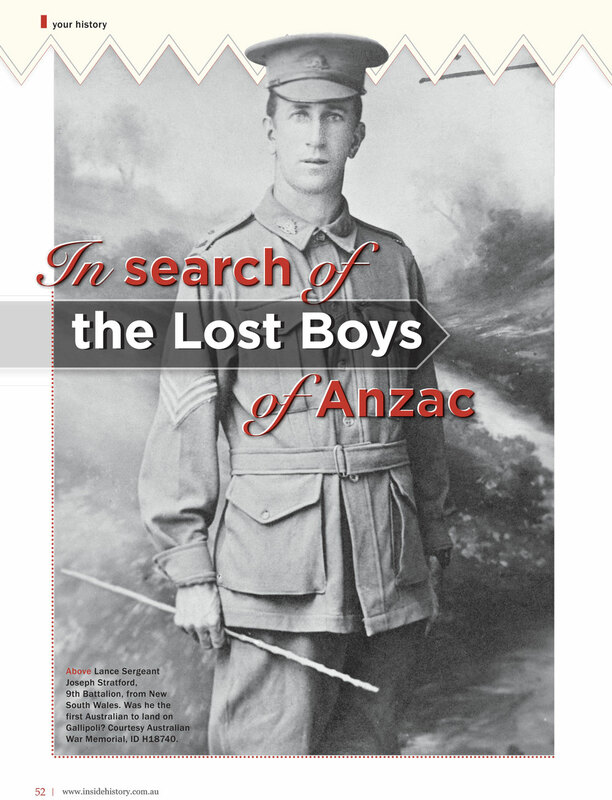 I began to explore the idea of a book about a group of dead men, a book I began calling Lost Boys of Anzac. The headstone at Gallipoli for Patrick Pyne from South Australia. Although it gives a range for his death of 25-29 April, the evidence of eye-witnesses makes clear that he died on 25 April. Who were these men? At first I thought I could write about all of the Australians killed in the landing at Gallipoli on 25 April 1915. I found that this would be a much stiffer proposition than I could undertake. Apart from the sheer number of individuals involved — the Australian War Memorial’s (AWM) Roll of Honour database lists 755 men as having died on that day — I soon discovered the research was nowhere near as straightforward as the existence of a neat database might suggest. I began trying to work out how I could achieve my purpose — to tell the stories of the dead of the landing — while keeping the task manageable. Eventually I narrowed my research down to six companies: two each from the 9th, 10th and 11th Battalions, men from Queensland, South Australia and Western Australia: what Charles Bean called the ‘outer states’. With just over 100 of these men, it began to seem that I might be able to do justice to their stories individually, but still say something meaningful about the collective of men who volunteered first — the men of 1914. The original officers of the 9th Battalion in 1914. Three of these men would die on 25 April 1915. Courtesy Australian War Memorial, ID C02496. I felt I’d be able to do this because Australians are fortunate to possess more detailed records of those who served in World War I than any comparable nation. As family historians know well, thanks to records preserved by the National Archives of Australia (NAA) and the AWM, the lives and deaths of those who served are documented in extraordinary detail. While the files of the first men to enlist are often frustratingly brief in recording their service, they document what followed their deaths in often heartbreaking detail. Even more illuminating are the Red Cross Missing and Wounded Enquiry Bureau files attached to the AWM’s Roll of Honour database. They tell of families’ anxieties and worries, the Red Cross’s search for the place and circumstances of a man’s death and — even more amazing — often of the last sighting of him and even of his final words. What’s more, virtually all these fundamental records are digitised and available online. (I say ‘virtually all’, because the State Library of South Australia holds Red Cross Missing records on microfiche in Adelaide, the only collection besides the War Memorial’s to have survived.) Newspaper reports (many available through Trove) and comrades’ diaries supplemented these sources. These records (and others, such as invaluable help from local and family historical societies from all over Australia) enabled me to work out who my Lost Boys might be. This was much more problematic than one might think, given that the AWM’s database gave a date of death for each man. In fact, the AWM’s date is only that allocated by an Australian Imperial Force (AIF) court of enquiry, usually held by the battalion in France in 1916 (and often at least doubtful) and where the ‘date’ is actually a range, usually ‘25-28 April’ — because a man was not at the first roll call after the landing, but no one saw him actually die, or lived to say so. A further complication came in that it was often difficult to establish which company a man had been in at the landing. Only two companies from the three battalions landed as part of the first wave, and while some men’s section and platoon could be identified, others could not easily be placed in any one of the companies selected to land before dawn. In this the Red Cross records were critical. They included many statements by men who claimed to be eye-witnesses, or to have heard reliable accounts of men’s deaths. They also introduce bizarre and seemingly improbable accounts of men supposedly seen alive months after they were certainly killed. Indeed, so prevalent were these false reports that they form the basis of an entire section in my book discussing the ‘ghosts’ of the Lost Boys. These accounts might be merely curious, except that they were often passed on to families, and formed the basis of months of false hopes and resulted in even greater heartbreak. To my astonishment, I found that by the time I was satisfied that I’d identified all of the Lost Boys, I found that I had exactly 100. This made the calculations of percentages (of Catholics, migrants, married men, sergeants, and so on) much easier. The Lost Boys’ individual stories span the fascinating, the intriguing, the sad and the poignant. While they were often called ‘boys’, most were not teenagers — only 13 were aged 19, and just one was 18. At least a fifth of the Lost Boys had been born in the British Isles or elsewhere in the empire. Another large minority, such as Joe Stratford enlisted far from their homes in Australia, making generalisations (for example, that the 11th Battalion men were ‘Western Australians’) suspect. But though the Lost Boys came from a variety of places and backgrounds, what unites them is that they all died on the beaches or hillsides of Gallipoli on 25 April 1915. They were almost all posted as ‘missing’, and remained so for many months. Some families were still holding out hope that their sons were wounded and amnesiac or captured two years and more after the landing. The stories of the Lost Boys’ families, how they learned of their sons’ fates, how they coped with the anxiety and uncertainty, how they grieved and remembered them, and how they often gave up other sons to ‘the War’, occupies the final third of the book, and is in many ways the most illuminating and haunting. It shows that while the Lost Boys were among the first Australians to die in battle in WWI, the effects of their deaths lingered for decades. The Lost Boys’ stories will, I hope, feed the curiosity Australians continue to express about World War I and how it affected our nation and its people almost a century ago.